It was an interesting day at the barn yesterday. Foggy, misty, cool but not really cold. When I arrived, the horses were grazing peacefully in the east pasture. Galahad followed me back to the fence, where I put on his halter and tied him so he’d stand still for me to treat his rain rot with iodine. Sometimes he gets bored and wants to wander off. The peace and quiet didn’t last long. I had gotten maybe six square inches of that big, broad back treated when things got going. It started with the mares in the other pasture. SOMETHING BAD, they said, was on the trail. Their intensity got the geldings’ attention, including Galahad’s. I couldn’t see a thing. 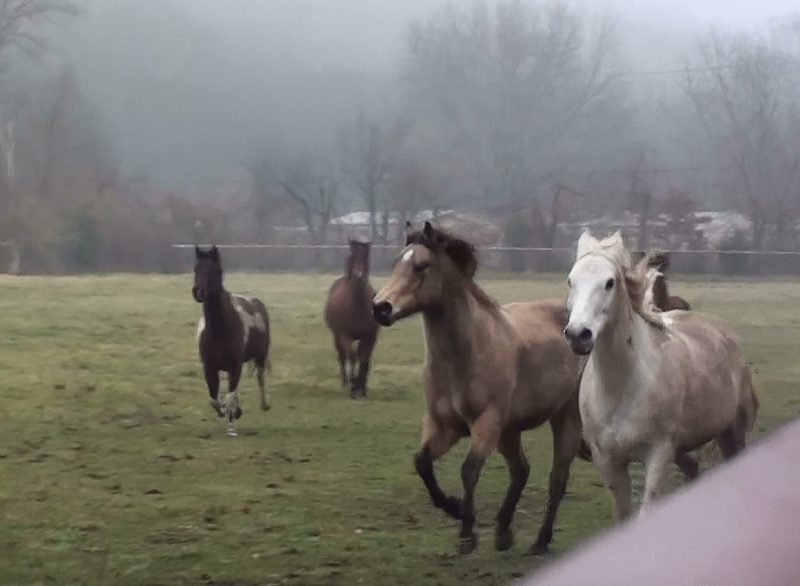 The rest of the geldings were tense, snorting and dancing, not really sure what was wrong. As everyone’s energy mounted, Galahad started to prance and snort, and I could feel my fear rising—an old reaction that I haven’t felt in a while. If he hadn’t been on the lead rope, I’d simply have moved him off to a safe distance. As it was, my mind called up the old image of a Raging Creature on a String. What to do? First thing I did was take a breath and feel into the fear. Yes, I really did have the presence of mind to become conscious of it, and to understand that although I was afraid, I do now have the tools and training to handle the situation. I’m quite proud of that split-second awareness! Guess I’ve learned something over these last few years! The next thing I did was to untie the rope from the fence. Then I waited to see what would happen. Didn’t have to wait long. He reared and tossed his head. I bumped the lead rope, surprisingly calmly, and he dropped back down. Then I backed him about 25 or 30 feet, asked him to circle me on the line a time or two in each direction, then backed him some more. He did it all with a lot of energy, but no resistance. Then I walked over and took the halter off, expecting him to whirl and run. He didn’t. He stayed facing me, paying attention to ME and not to his herd mates, who were still milling excitedly around near the mares. In fact, I was able to back him up, circle him a bit more, move his hind end, and get him to change directions, all at liberty. Then I sent him off to be with the herd. Pretty amazing. In general, I think I did OK. My first thought was to control him—back to the natural horsemanship techniques that are (thankfully, sometimes) second nature by now. Control is probably not a bad thing to think about, considering that he’s 1100+ pounds of muscle, bone, and hoof. And goodness knows how tall he is when he’s standing on his hind legs! There was also the fact that he was not at liberty—I couldn’t readily send him off—and I needed to have him calm enough to get his halter off safely. The unexpected and delightful part of this experience is twofold: First, he never actually tried to get away. His rearing was just a statement of what he’d LIKE to do. He wasn’t threatening me, and had he wanted to get away, he most certainly could have. I wouldn’t have tried to stop him. Second, he trusted me way more than I trusted myself in this situation. Galahad did what I asked, even though the other horses were agitated and moving around. He chose me over his herd. I know that, because he did not leave me after I took his halter off, until I asked him to go. How interesting. Hopefully, next time I’ll remember all this, and not need to be afraid. My horse trusts me. That is amazing. This entry was posted in Galahad, Liberty Training, Natural Horsemanship and tagged Galahad, Rope halter.